“Pop-tech”—the technology that supports pop culture—is a double-edged sword that is, in its worst aspects, cutting away and into talent development by stifling, squandering, obstructing, discouraging, frittering and scattering it. 8. Elimination of paper-and-pencil thinking and drawing: There’s a strong case to be argued for the catalytic role of low-tech pencils, paper, chalk and boards in talent development, as the photo of Einstein at a chalkboard evidences. Moreover, it’s a role that smart phones, tablets, iPads and even PCs, notepads and laptops cannot usurp or erase. Much older PCs actually did play a similar role in talent development. Some of the earliest 20th –century personal computers allowed users to easily write code for systems of equations, computer simulations, graphics and myriad other applications and tasks. For example, once upon a time, I was working on developing my skills in this area, e.g., doing mathematical simulations of species interactions, when those options vanished from the standard capabilities of the typical PC. Sure, I’ve seen software that will solve equations and contribute to mathematical talent development; but, as a shortcut, the ones I’ve seen work through passive talent development, by spoon feeding, not by active, reflective, creative engagement and practice. Applying formulas? Sure. Deriving them? Not likely. Also, even when software options exist, applying them disrupts the kind of rapid mental flow, spontaneous thought and continuous engagement that facilitate development and application of specific talents. For example, having to prowl drop-down menus, hunt and peck at keyboard numeric pads and search for symbols to insert distracts the mind from the main cognitive task of following one’s racing thoughts, by requiring completion of very distracting, intrusive manual tasks. 9. Social media: Of course social media have many valuable aspects. My concern here is with the enormous opportunity costs incurred by choosing to devote one’s time, energy, talents and judgment to reviewing beer-bong vomit photos to post and Grey’s Anatomy—the TV show, instead of Gray’s Anatomy—the med student Bible, climatological maps, mastery of a piano concerto, DYI carpentry or one’s resume. 10. “Smart” phones: According to a recent report out of Australia, the average smart-phone user accesses his or her phone 150 times per day. Think of that as 150 opportunities to think about, imagine or actually do something else—like learn something useful and also maybe even challenging and marketable. Unfortunately, the most popular apps have little to nothing to do with practice or development of important talents. Although, in countless ways, they can be extremely useful tools, many of these apps and gadgets take distraction and over-choice to new heights and in new dimensions—many of them created for and cluttered with the toys and noise of canny consumer-focused marketing. There are now so many competing and time-and-energy consuming apps—more than 1 million—that the idea of mastering and having a talent for using them should be encapsulated in an appropriate, new concept: “cappability”. Here too, the most obvious impact on talent development takes the form of opportunity cost: With the erratic, uneven exceptions of Google search, Gmail and one stock app, none of the marketingland.com-cited “top 10 mobile phone apps of 2013” intrinsically contributes to personal talent development, apart from the likes of resume-writing, photo formatting and video-making talents. Likewise, the aforementioned Australian report lists as its top ten apps none that requires or develops much in the way of career-related talents, e.g., Facebook, MyFitnessPal, any banking app, Beanhunter—for finding cafes nearby, and iView—for watching TV shows on demand. Viewed individually and separately, these 10 “dots” are like 10 different peaks on a cultural landscape. But viewed collectively and strategically—they suggest implementation and fortification of a battle plan or mosaic of conspiratorial control and stifling of productive talent and thinking, to keep us dumb, compliant and spending. Just as likely and only a little less bad, the appearance of a conspiracy against the mind may be nothing more than the predictable consequence of the kind of limited thinking each of these pop technologies and entertainments elicits in those who are not in the industries that create and promote them. Of course, there are outstanding illustrations of incredible talent development and achievement because of as well as despite the technology and content of pop-culture, e.g., Taylor Wilson, the Colorado teen prodigy who, at 14, created the world’s first privately constructed, portable nuclear fusion reactor. 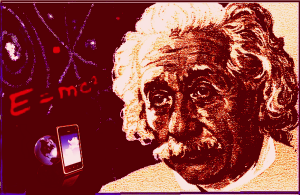 But it must be asked whether Einstein would have discovered E=MC2 if he had been following Miley Cyrus twerking blogs or calculating hockey-league stats at what may have been a once-in-a-lifetime “eureka!” moment, like the catalytic, breakthrough moment he imagined himself riding on a light beam. Ditto for Taylor Wilson, whose latest eureka!-project is completely safe, non-polluting compact reactors. Then, assuming no NHL, NBA or video-game distractions or addictions, there’s the creative challenge Einstein and countless others may have postponed or dodged if they had to think and type with tiny keys, tiny screen and tiny messages—with little if any deeply mentally engaged and sustained paper-and-pencil work, including imaginative sketches, mathematical derivations or proofs, or any flow of ideas longer than a dance video on MTV. In rebuttal, you say, “But look how much learning and personal development pop tech facilitates?” Of course, but even the most talent-friendly aspects of modern pop-technology carry substantial talent-development costs and risks. For example, suppose, being curious, you check out a YouTube video about the derivation of Einstein’s E=MC2. After all, parroting the equation is the easy part; anybody can do that; deriving it mathematically?—That’s something else [shown in the only known photo of Einstein doing it]. If you’ve studied calculus, the derivation is easy to follow, even if not easy to think up. But, there are a couple of tricky steps that are hard to do in one’s head. I didn’t even attempt that, despite my familiarity with calculus. Why? Because I didn’t have pencil and paper handy to do the math myself. Then, who does these digital days? So, I let it slide and with it, the opportunity and incentives to beef up, develop or at least exercise whatever talents I may have for math—which I have at times applied professionally, in both writing and teaching, including calculus. The more important point is captured by this question: Would or could the derivation of the formula ever have been achieved without paper and pencil, say, on a smart phone or a tablet—which makes real typing virtually impossible? In Einstein’s and Taylor Wilson’s cases, probably. But what about the case of the average physics student with potential for more? Sure, there is software that will perform complex calculations much faster than any mind. But “derivation software”, which has to be talent-testing, talent-developing and creative, i.e., non-algorithmic?